Don your cloaks and set your tone to ‘menacing’! 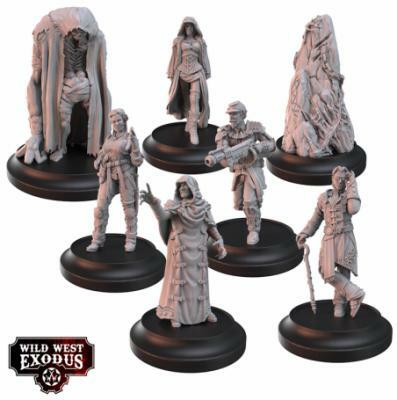 Today we are looking at the new Absolute Power Posse set from Warcradle Studios for Wild West Exodus. The Absolute power posse is the starter set for the Hex faction. The Hex just wants to be left alone. Hunted across the galaxy, the Hex has come to Earth to find a new home for itself. It calls out to those similarly abused and victimised so that it might find companionship and learn from their culture and endeavours. The Hex has no sense of right and wrong, it only knows survival and the loneliness that eons of persecution have brought about. On Earth it has made new allies and bonded with many who are similarly persecuted, but the Hex’s gift of power is misused by humanity. Those who were the victim now have the strength to strike back at those who made them suffer. Led by a Dark Council the Hex manipulate and inveigle themselves in the great nations of the world, for only through control can they truly be safe. Inside the Absolute Power set you will find a complete posse ready to go. Also included are a few alternate posse cards so you can do something different if you wish. Straight from the box you can make two Hex Faction posses. Most of the models in the box are resin and comprised of very few parts. This is great for getting it onto a table quickly. However, it’s less than ideal should you want to do some conversions. John Hunter Bennet took a bit more work than the rest but still was a pretty straight forward model to put together. Megan Wild comes in option one and Garret Morden in the second option slot. The third option allows only Hex hands or support units allowing Kreechur would fit in here. The fourth slot allows a support unit which the Hexalith is followed by slot five which can take two face units. The last two models John Hunter Bennett and Maria Torres-Villa would fit in there. The Hex Faction Posse seemingly allows a little bit more flexibility in creating a posse. 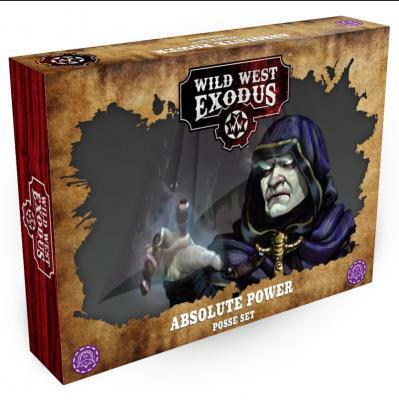 However, the Absolute Power posse allows models to gain the shrouded special rule when close to a Hexalith. Additionally, every slot allows you to take an additional unit as well as what is listed above. The scalable options for this posse in terms of game size is potentially huge. This is whilst still maintaining the same core of the posse. Inside the box you get 1020 points of Hex. This is a great starting level for a good-sized force. This set can be slimmed down easily for smaller games should you wish. There’s also not a great deal needing to be added for those larger battles. Summarised, this is a great little starter set and will meet the needs of both new and experienced players. It’s always nice when both of those boxes can be ticked separately! If you would like to see more of what’s going on or keep up to date with news and the team be sure to keep checking back.. Alternatively, you can like and follow us on Facebook.